Excellent detail. The Kit comes unfinished and unassembled. MOW Equipment — Kit includes crawler with Blade and Canopy. Commonly used for RR derailments. MOW Equipment — Kit includes crawler with side boom crane attachment. Commonly used for RR derailments. MOW Equipment — Includes 2 generator trailers, warning & danger labeling & optional HY-Rail wheels. MOW Equipment — Excellent detail. The Kit comes unfinished and unassembled. N Scale 100 Ton Electra-Haul Mine Truck. 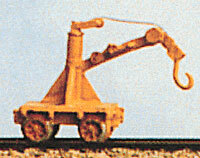 N Scale MOW Equipment — Hydraulic High Rail MOW Crane.